(Bloomberg) -- It’s a race to the top in the international payments industry. Fidelity National Information Services Inc.’s $35.5 billion deal to acquire Worldpay Inc., the biggest deal ever in the international payments sector, follows by just two months the previous record-holder -- Fiserv Inc.’s agreement in January to pay $22 billion for First Data Corp.
Dealmaking is accelerating as payments companies snap up rivals to grab market share, with investors wondering which firms might be next. Global Payments Inc. and Total System Services Inc. were among stocks that gained in early trading Monday, but dropped by midday. Both FIS and Worldpay provide the technological infrastructure that lets consumers securely pay an overseas vendor on an e-commerce site or tap their cards to buy a cup of coffee. Industrywide revenue is projected to surge to $2.4 trillion by 2027, according to a report from Boston Consulting Group and Swift. 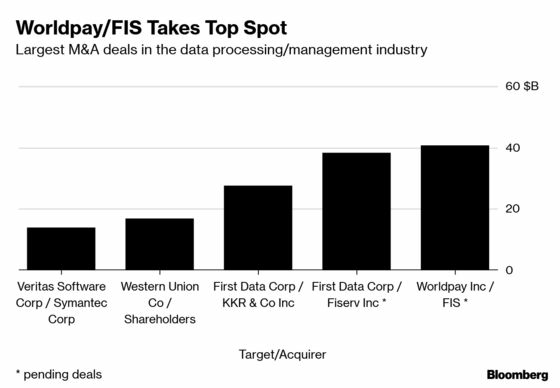 FIS, which focuses on the software behind payments for retail and banking, will assume Worldpay’s debt, bringing the enterprise value of the deal to about $43 billion, the companies said Monday. Worldpay shareholders will receive $11 a share in cash and 0.9287 of a FIS share, which was worth a combined $112.12 as of last week’s close. That was 14 percent more than Friday’s closing price for Symmes Township, Ohio-based Worldpay. Including Class B shares and warrants and options, the deal has an implied equity value of $35.5 billion. Worldpay shares jumped 9.8 percent to $108.38 at 1:39 p.m. in New York, after trading as high as $112. Fidelity National, which is based in Jacksonville, Florida, declined 0.7 percent to $108.08. Worldpay pared earlier gains of as much as 14 percent as some analysts questioned why the company agreed to be bought before trying to squeeze more value from its 2017 merger with Vantiv Inc.
Monday’s deal, when completed, will make the combined company the biggest in the processing and payments industry, according to data compiled by Bloomberg. Initial public offerings have been climbing along with mergers. Italy’s Nexi SpA said Monday that it plans an IPO in Milan by the end of April, aiming to raise as much as 2.7 billion euros ($3.1 billion), according to people familiar with the plan. Adyen was one of the best-performing IPOs globally in 2018. Network International, a Middle Eastern payments processor, on March 14 announced its plan for a London IPO in the next four weeks.